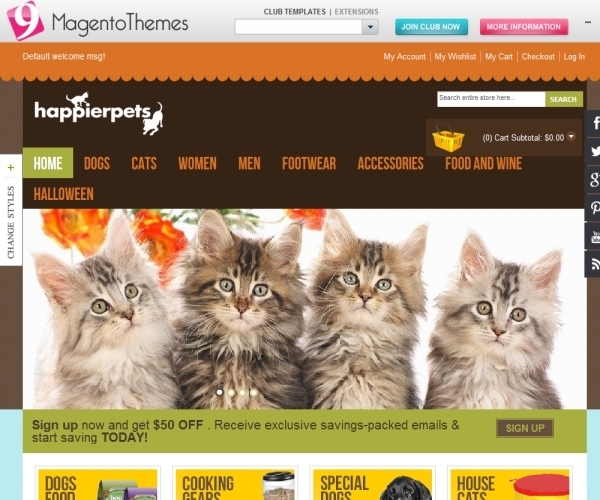 MT PetShop is a perfect choice for your online pet store and comes with a superb design scheme and flexible storefront options and is sure to be a hit with your users. The theme also includes an opinion poll feature, a newsletter opt-in facility and includes a dynamic style picker using which users can change the color and font options right from their browser. It’s also responsive and can be viewed from tablets and Smartphone’s along with regular desktops. The theme is built on the latest 100% table less design model and is cross browser compatible. Unlimited background patterns and an advanced admin panel with Google font integration help you easily customize all design elements. The theme also includes dynamic language options and embedded social media links. The homepage features a full-width image slider for your featured products. Prominent call to action spaces help you easily insert banners and showcase your discount offerings. It also has a secondary sliding carousel for your latest products as well as an animated tabbed content widget where you can showcase multiple products categories within the same space. The sidebar and footer are widget ready and come with a quicklink menu, user polls and a tag cloud. The theme features one of the best navigation effects and has an integrated Megamenu and Smartmenu where you can also add banners, images and video clips within the menu. The theme has a separate top menu for account management and shopping cart options along with a main multi-level smartmenu. Users can also do a keyword search using the search box in the header. A separate shopping cart icon shows the current cart contents and associated cost. You can also include quick-links in the footer and the sidebar. Individual product pages support multiple images and also have a “Cloud Zoom” plug-in using which you can hover over an image and see the magnified version of the area in a separate window. You can post a quick overview and use the tabbed content widget to showcase description, reviews, tags etc within the same space. Registered users can also submit reviews and star ratings and can also include product tags. This option allows users to search by specifying SKU, price range, tax, size etc. You can also add additional attributes for searching. Users can also check the status of an order by order-id and other attributes. The theme comes with included PSD files and supports easy design and functional customization. It’s compatible with major browsers and works with Magento 1.6.0.0 and higher. Awesome design scheme along with the Magento advantage of a powerful backend panel make it a very good choice for your product sites. The theme is user-friendly and comes with advanced navigation features which help users easily locate, compare and purchase products. The MT PetShop Theme is priced at $100 and can be purchased from the below link.